Familias En Accion and Los Ninos Cuentan and five illegal aliens are suing the Oregon Governor Kate Brown, numerous members of the Oregon Department of Transportation Commission, and the Administrator of the Driver and Motor Vehicles Division for the Oregon Department of Transportation. The complaint was filed in early November. A federal district judge in Oregon will soon be deciding whether the group of illegal immigrants had their constitutional rights violated after voters struck down via voter referendum, S.B. 833, that would have given driving privileges to illegal aliens in Oregon. When passed and signed into law by the governor, S.B. 833 directed the Department of Transportation to issue a driver card to an applicant who does not provide proof of legal presence in the U.S. The only requirement for them is to comply with the requirements for driving privileges, and to have lived in Oregon for more than one year. Opponents say the law was hurriedly passed by the legislature and governor. According to the group’s class action complaint, the 2014 citizen referendum that nullified the measure (by 66 percent of the vote), “arbitrarily and irrationally” excludes them from driving privileges and is motivated by racial animus against Mexicans and Central Americans. 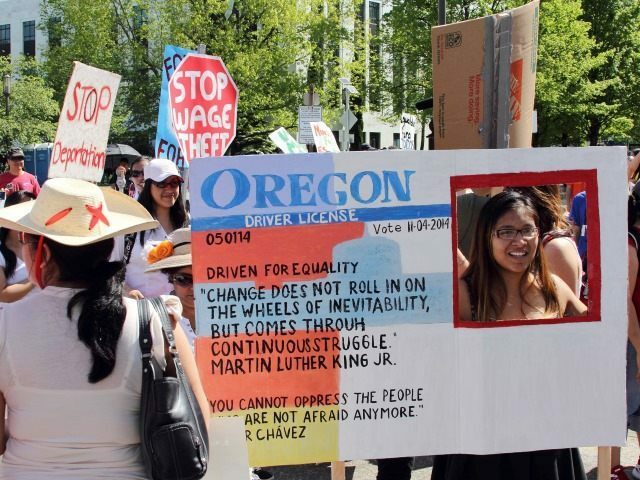 In 2013, the Oregon state government attempted to join a growing number of states that have passed laws granting driving privileges to illegal aliens. Before the bill was implemented, a pro-immigration control advocate, Oregonians for Immigration Reform (OFIR), sparked a ballot initiative gathering over 58,000 signatures to let voters decide whether they wanted the law. The initiative received resounding support from voters concerned that such privileges would lead to more illegal aliens moving into their state, resulting in more crime and welfare abuse and further disruption to Oregon’s communities and labor market. Although the illegal aliens are suing the state of Oregon in order to get the citizen-ballot results found void and unenforceable, OFIR has filed a motion to intervene in the case. According to OFIR’s attorneys, the Immigration Reform Law Institute (IRLI), a D.C. nonprofit law firm, the Oregon attorney general’s office appears to volunteer an argument on behalf of the illegal immigrant plaintiffs in its brief, specifically that the Fourteenth Amendment protects politically unpopular minority groups from being targeted by state action and that this group could encompass illegal immigrants. The Oregon AG’s office also claims that OFIR made derogatory and racist statements about Hispanics in their get-out-the-vote-efforts, which is absolutely not true, according to OFIR and their attorneys. Nor does OFIR have a “general interest in denying rights to immigrants” as the plaintiffs have claimed, says Axelrod. “OFIR has never sought to deny rights to lawful immigrants. OFIR simply believes, in common with 66 percent of Oregon voters, that granting driving privileges to those present in this country in violation of the law is poor public policy,” said Axelrod. Earlier this month, attorneys for the illegal aliens, the Oregon Law Center (OLC), filed a brief opposing OFIR’s motion to intervene in the case. Even though OFIR arranged the very ballot-measure that’s involved in the case, the illegal aliens’ attorneys are relying on the 2013 decision in Hollingsworth v. Perry, where the Supreme Court ruled that proponents of traditional marriage in California could not make their government enforce the successful ballot initiative due to the group not having a sufficient “personal stake in defending its enforcement.” That decision, OFIR attorneys argue, applies only to a party’s right to bring a case in court, not to intervene on behalf of a party to the case. On top of claiming rights normally given only to citizens and legal residents, the illegal aliens appear to be using a federal taxpayer-grant program to pay for their legal representation in violation of congressional appropriations law. According to OLC’s website, the group receives numerous grants from the federal government, including from the Legal Services Corporation (LSC), a taxpayer-funded grant-making entity created by Congress in 1974. IRLI says that since the mid-1980’s, when LSC was caught providing federal grants to organizations representing illegal aliens, Congress prohibited the agency from spending appropriated funds for “litigation and related activities” for “representation of illegal aliens.” The LSC says that it does not fund the Oregon Law Center. The prohibition from spending tax dollar-funded federal funds is still on the books today; however, lawyers for the illegal immigrants appear to be receiving taxpayer money anyway, says the attorneys for OFIR. That the LSC feels safe in violating Congress’s prohibition shouldn’t be surprising, says Axelrod. Since 2014, the Obama administration has distributed millions of dollars in grants to lawyers representing illegal immigrant minors from Central America. 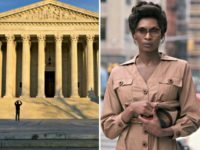 There have been several articles and treatises written about why the Legal Services Corporation must be abolished, including this one by the Heritage Foundation. Breitbart News reported in February of this year that California has issued driver licenses to more than a half million illegal immigrants (605,000) in 2015. This was the first year that the illegal immigrants were eligible for driving certification in California. California Assembly Bill 60 (AB 60) was implemented on January 2, 2o15.